A year or two ago, whilst I was in Madrid, I bought a copy of Exploration Fawcett (1953). 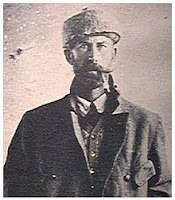 The story of Colonel Percy Harrison Fawcett (born 1867) has fascinated many people since the explorer’s disappearance somewhere in the Brazilian jungle in 1925. 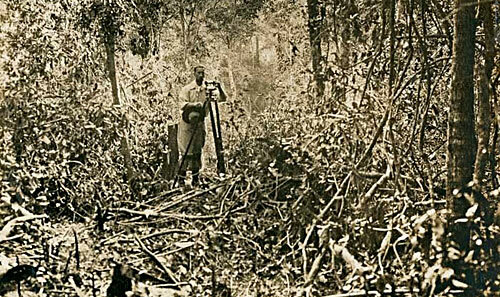 Fawcett spent a large part of his life pursuing legends, and, in so doing, he eventually became a legend himself. Many writers have made much of the “mystery” of his disappearance, fuelled not least by Fawcett’s famously secretive and obsessive nature, as well as his mystical and theosophical leanings. Colonel Fawcett, a personal friend of the writer H. Rider Haggard, seems to have been the embodiment of the Victorian ideal of the gentleman-explorer-adventurer-hero, an upright and moral man, unbowed by hardship, toiling with single-minded determination towards his ultimate goal – death or glory! The stuff of King Solomon’s Mines to Indiana Jones and the Raiders of the Lost Ark, Fawcett’s story is the real thing and consequently never seems to stray far from the popular imagination. 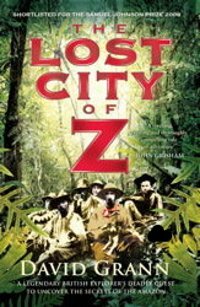 Many people have obsessed over discovering Fawcett’s fate in the way that he obsessed over finding his lost city of “Z.” Perhaps because the story is an open ended one people continue to be drawn to wonder and speculate about what fate might have ultimately befallen the lost explorer. His search for “Z” has transmuted into our search for him. As he explored one of the last blank spaces on the map, so too, he has become an enduring blank space himself. Fawcett was convinced that somewhere in the dense jungles of the Amazon there existed the ruins of an advanced civilisation. The chronicles of the Spanish Conquistadors had made mention of the myths of El Dorado, a fabled city of vast cultural wealth and riches, and some Spanish chroniclers had even claimed to have passed through such a place in the Amazon. Hiram Bingham’s (re-)discovery of a lost city of the Incas, Machu Picchu, in Peru in 1911 – a vast and complex network of stone buildings of staggering architectural beauty and achievement perched atop a majestic and imposing mountain height – seemed to indicate that there was still much to be discovered concerning the pre-Columbian period of South America’s history. 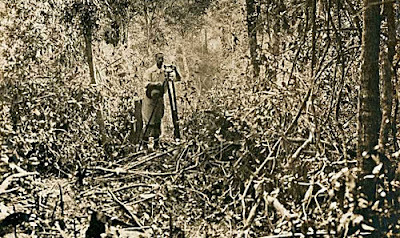 Yet the idea of a lost civilisation having once resided in the dense and inhospitable jungles of the Amazon seemed to stretch such fancies a little too far for many contemporary (and later) archaeologists, but Fawcett was not to be swayed. He was convinced he had found incontrovertible evidence which pointed to this fanciful notion being founded upon real facts, and he was determined to find and reveal the truth of the existence of “Z.” However, in the face of stiff competition from rival expeditions, particularly those of Dr Alexander Hamilton Rice (1875-1956), Fawcett grew increasingly secretive in his quest; and after serving in the First World War and witnessing the horrors there, like many veterans, he became increasingly eccentric and cranky. He turned to spiritualism which seemed not only to sustain, but also to fuel the zeal of his search all the more. This spiritualism some have seen as diluting (or, perhaps, polluting) his previously rigorous scientific ardour. Whichever the case may be he remained undeterred from his goal and finally set out with his eldest son, Jack, and Jack’s best friend, Raleigh Rimmel, on a three man trek into the unknown, never to return. Grann meets the anthropologist Michael Heckenberger in a remote Xingu village. Heckenberger has been one of the scholars pioneering the archaeological research of the Amazon region, and he has very recently uncovered remains which have caused academics to reconsider past assumptions about the area and the cultures which have inhabited this part of the Americas. Perhaps Fawcett was not quite so deluded after all. The windmills the famous Don Quixote of the Mato Grosso spent so long in seeking seem now to have been a very real possibility. Perhaps for too long, because of wonders such as Machu Picchu or indeed the numerous Mayan ruins of the Yucatan, first explored and documented by John Lloyd Stephens and Frederick Catherwood in the 1839 and 1841, people have always assumed Fawcett was seeking a towering stone metropolis with streets paved with gold, when perhaps the reality – which Fawcett may well have been partly aware of – was more along the lines of vast, wooden palisaded compounds surrounded by monumental ditches and moats, connected by precisely laid networks of roads and causeways, accurately configured along precise geometries. A city built of such perishable organics and clays would vanish just as easily as the mortal clay of an individual man, but, so too it seems that traces of the indomitable will always remain – perhaps one day, when the history of this region – the history of “Z” – is more fully known, we may also finally know the real fate of Colonel Fawcett and his two companions.